Tourmaline is the only stone that comes in all colours of rainbow. There is no a tint of a colour in tourmaline that would not be pretty. However, one of my favourite colours in this gem is dark pink. 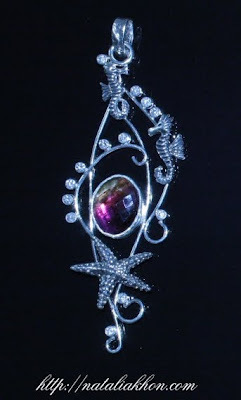 It is a perfect stone to represent a treasure you could find at the bottom of the sea. The backing for the faceted cabochon stone is polished silver, so the transparent stone will always shine, no matter what the background for the necklace is (dark or light).